GM’s brands are and have been rethinking a few things. 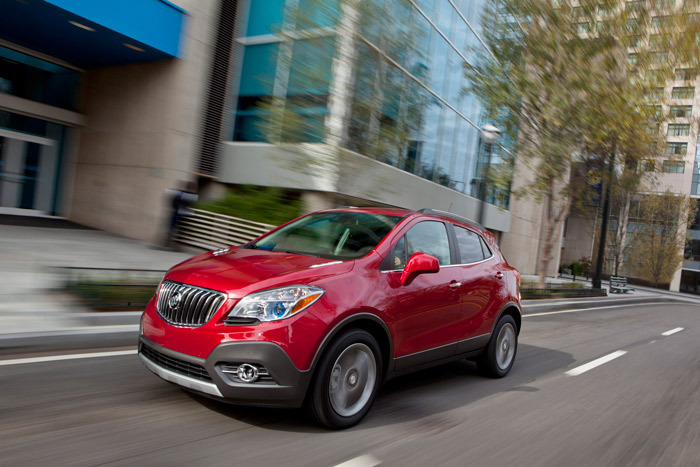 Buick is no exception, and this is no more obvious than after taking one look at the new Encore compact SUV. If it weren’t for the grille, few would be able to guess that it is a Buick, and it’s the same story with the tiny engine behind it. This may not provoke much excitement, but it is a curious little machine. The Encore looks like it’s been squished lengthwise, so its proportions just aren’t right. It almost looks like a toy car, and not the cool kind. This might be because the Encore is actually pretty tiny for what it’s trying to be. Less than 170-inches long, it’s a shrimp in the SUV segment. It does have four large doors, which will make getting in and out easier than you might think, but everything else on the outside just seems strange in both size and proportion. We admire Buick for stepping out of their comfort zone, but in the styling department this gamble hasn’t paid off. Despite its outward appearance, it’s actually good for transporting goods or people (maybe not always both) thanks to the hatchback, folding rear seats and storage bins throughout. 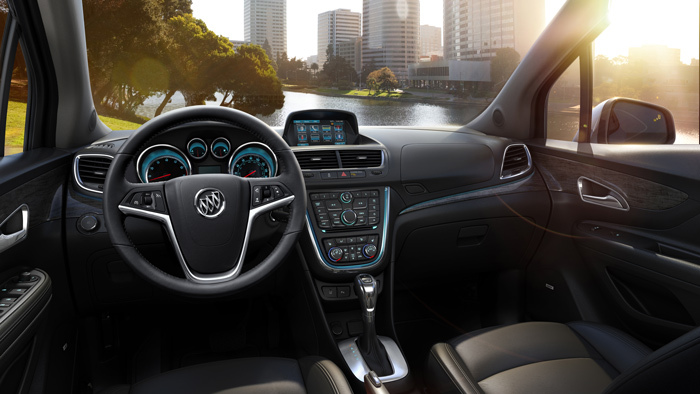 The rest of the interior does have an air of luxury about it, and the Premium Group package found on our test car also gets you front and rear park assist, forward collision alert and lane departure warning. Any average person would be satisfied with the comfort and internal capacity of the Encore, and that’s really what this car is all about. 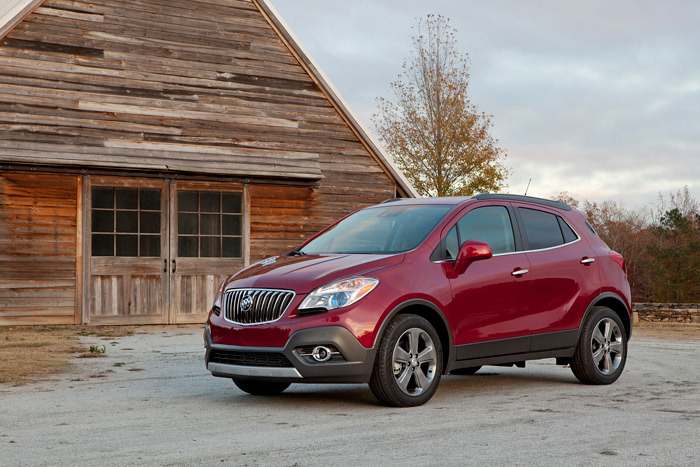 It has a bit of luxury flare to distinguish it as a Buick, but the Encore’s destiny will always be as a practical, safe daily driver. Buick is probably proudest of the fuel economy. With the standard FWD the 1.4 liter turbo does 33 highway mpg. The Ecotec engine, the smallest in Buick’s history, makes 138 horsepower, enough for the 3,200 pound Encore to get out of its own way but really not anything more. Our test car was FWD, but all-wheel-drive is an available but expensive ($1,500) and probably unnecessary option. 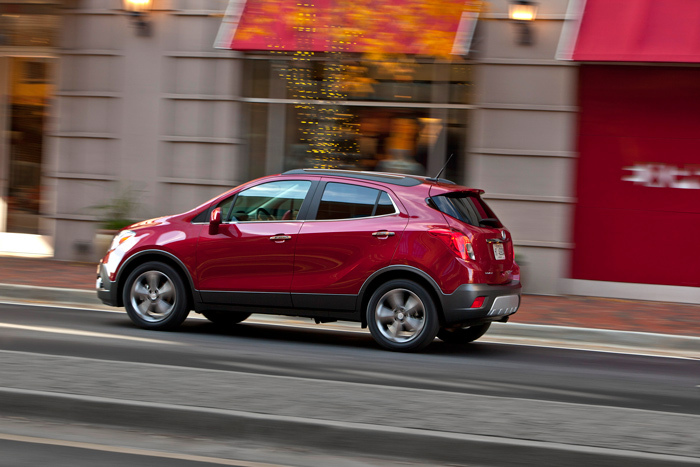 The new for 2013 Buick Encore is a somewhat unique vehicle in the big crowd of small SUVs we have here in America. Cars of this type that are this small just aren’t sold in the States right now, but Buick is onto something with July marking its best sales month since launch with 3,098 deliveries. As fuel economy gets more important to American motorists, they will probably still want to see the familiar SUV shape in the garage. That means plenty more cars like the Encore may very well be in our future. So while it will be invisible to enthusiasts, it is a fairly capable vehicle that will do anything that most motorists would ever need of it. For more information, visit Buick.com. Don’t understand the styling comments – it looks like a lot of other “little SUVs” – plus speaking of unusual, I just saw a Nissan (maybe?) vehicle similar to this with a convertible top – OMG!! I must be out of touch when it comes to taste. Regarding this Buick, it seems too expensive for what it is or is trying to accomplish – JMO.